Heavyweight see-through jacket with built-in antimicrobial protection. 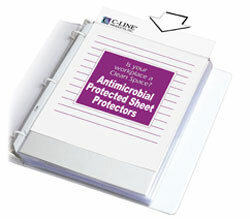 Antimicrobial protection helps prevent the growth of stain causing bacteria, yeasts, molds, and fungi. Open on long side for easy access. Clear finish - view X-Ray right through jacket. 12 1/4 x 10 1/2. 25/BX.